Kathleen 'Kat' Pearson-Thomas (1)Kathleen �Kat� Pearson-Thomas was born circa 1965 in Long Beach California to parents who were steeped in religious music and by the time that she could stand up and walk she was inducted into the church choir. Her parents also had a perchance for party�s and a liking for blues and soul. The combination was a heady mix that Kat soon latched onto and from an early age she became the family DJ spinning Blues, R&B, Soul and Tamla Motown. Moving to London in her twenty�s she decided to try her luck as a singer in a girl band called Crimson and The Nasty Pinks which got as far as rehearsing and making a video before disbanding. Not to be deterred she swiftly moved into �Black Girl Rock� who appeared on The Word and recorded a single on D:Ream Records that was impressive enough to lead into a tour of the UK, Belgium, Russia and Italy. She then signed to Columbia Records with a band called Comanchee Park that issued an album �Crucify� and they wrote the music for channel 4�s �Naked City�. The band appeared to sell-out crowds in The Shepard�s Bush Empire, The Forum in Kentish Town and The Grand in Clapham before they embarked on a two-year tour of Europe. Dates included the prestigious Montreux Jazz Festival in Switzerland before their being caught up in the bloodbath at Columbia Records that down sized the company. Shortly after that they disbanded. Kat decided to move into the theatre business and appeared in �Funny Girl� at the Bloomsbury Theatre and �What�s Love Got To Do With It� at The Hackney Empire. At the same time she decided to become a photo model and was videoed pouting in the Chemical Brothers hit video �Block Rockin� Beats� and a slew of other adverts including the famous �Bald is Beautiful� look for Carlsberg Beer. During this time she also appeared on Top of the Pops, TFI Friday and the Jonathan Ross Show as a singer/bass player. She then toured extensively as a dancer throughout Italy with M.A.R.S �Pump up The Volume�. Kathleen then relocated to Spain and it was here at The Mijas Blues Festival last summer that I heard her for the first time. Listening to her she had obviously gone back to her roots singing mainly blues and soul with the odd pop song thrown in for good measure. The next act at Mijas was Peaches Staton who worked her way through a set of soul standards that did not stretch her and the crowd sat back to wait for the main man Muddy Waters Jnr. However, when it came to the closer Peaches announced a Betty Wright song and asked Kat to help her out. The band picked up and the two ladies went back to church in a call and response segment - which was riveting. 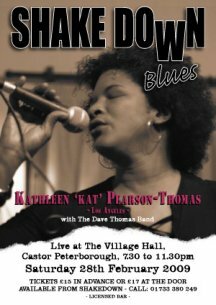 I decided on the spot that it would be great fun to have Kathleen Pearson-Thomas appear at Shakedown Blues and to hear more of the gospel influenced deep soul blues that she is obviously capable of singing. I came back home clutching her business card. A chat with Dave Thomas solidified the idea and Kat was booked.